Hello, we are The Hot Shots - Essex wedding band & function band ExTrAoRdInAiRe! We are a professional, all-male 4 piece function band who perform live at weddings, corporate events and private parties. We are based in Essex but travel throughout the UK, playing classic and modern indie / rock / pop chart hits. The Hot Shots band hire Essex have played at V Festival, London Astoria, Indigo2 (o2 arena), Santa Pod Raceway to name just a few special venues! We've played alongside artists such as Scouting for Girls, Steven Adler from Guns 'n' Roses and Matt Cardle, the X-Factor winner of 2010. 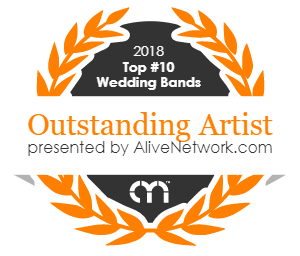 More recently we won the 2015, 2016, 2017 & 2018 Wedding Industry Award for Best Wedding Band in the East of England region!